Despite it's odd, fuzzy appearance, I think the Kiwi Fruit rocks the Casbah - it tastes a little like the love child of a strawberry and a melon. It's sweet and juicy but also has a unique little tang all it's own. Originally called called the Chinese Gooseberry, then the Sunny Peach, the Kiwi fruit (Actinidia chinensis) was named after a flightless bird native to New Zealand - the Kiwi Bird - as a marketing strategy to associate the fruit with New Zealand. Originally from the Yangtze Valley in China, the "Chinese Gooseberry" was brought back to New Zealand by Isabel Fraser in the early 1900s. There are over 400 varieties of this vine fruit which is grown through the late Spring to early Fall months. 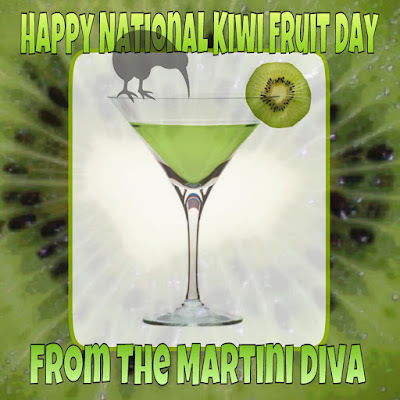 National Kiwi Fruit Day is celebrated on the first day of winter every year. Not to be confused with National Kiwi Day aka National Waitangi Day, which is a public holiday held on the 6th of February in New Zealand to commemorate the signing of the Treaty of Waitangi, New Zealand's founding document. Of interesting note, the people of New Zealand are often referred to as Kiwi's as well. 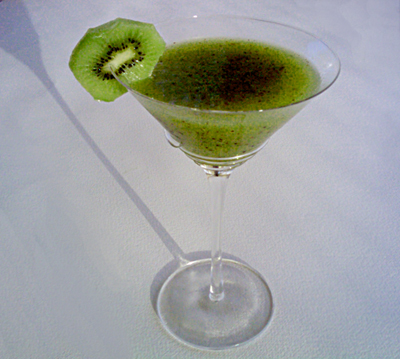 Kiwi fruits are rich in many vitamins, flavonoids and minerals. Kiwis are high in fiber. When kiwi juice is mix with water and vodka it can be use as astringent to help tighten and tone the skin. Kiwi fruit can help prevent age related macular degeneration. Kiwis are rich in phytonutrients which prevent blood clotting and control fatty acid levels in your blood. Kiwi fruit is high in potassium which helps prevent high blood pressure. The seeds are edible and highly nutritious.